Set on a 1.75-acre high-elevation homesite in the center of the 2,050-acre Boot Ranch private club community, the Texas Monthly Show Home takes advantage of distant Hill Country views that can be enjoyed from almost every room - even the master closet. The light and airy space is more of a retreat than a closet. 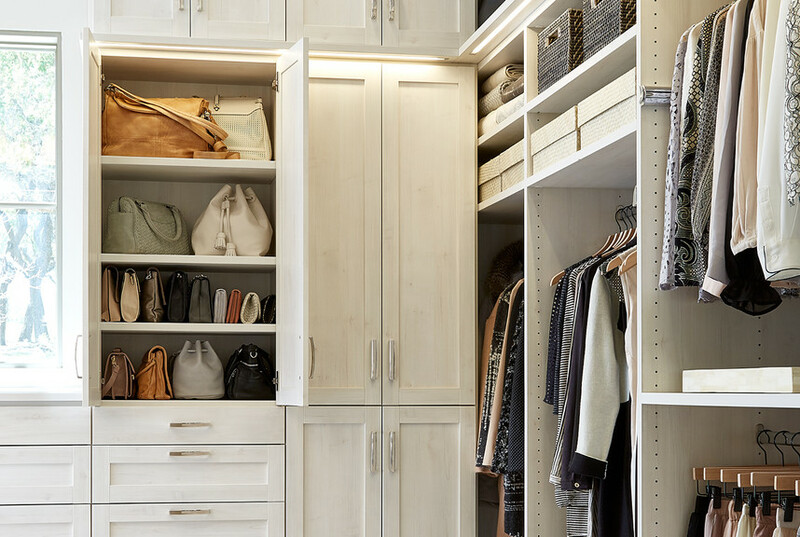 Featuring the Aspen finish with gorgeous Shaker Doors and Drawers, this Laren custom closet blends with the rustic, yet stylish interior of the Show Home. In fact, the cabinetry surrounding the window is almost as inviting as the view beyond the glass. A chrome three-light chandelier and Curved Chrome Pulls add an elegant sparkle to the space. Behind the Shaker Doors, perfectly spaced 1"-thick shelves accommodate handbags, shoes and of course, boots. Integrated LED lighting highlights each item. A neutral, nail-head stool makes for the perfect place to slip on your favorite heels or boots. Multiple closet rods organize hanging clothes by type, while Nova Woven Storage Bins in natural colors, Blackwash Rattan Storage Bins and lidded Pandan Shirt Boxes contain seasonal items and accessories. 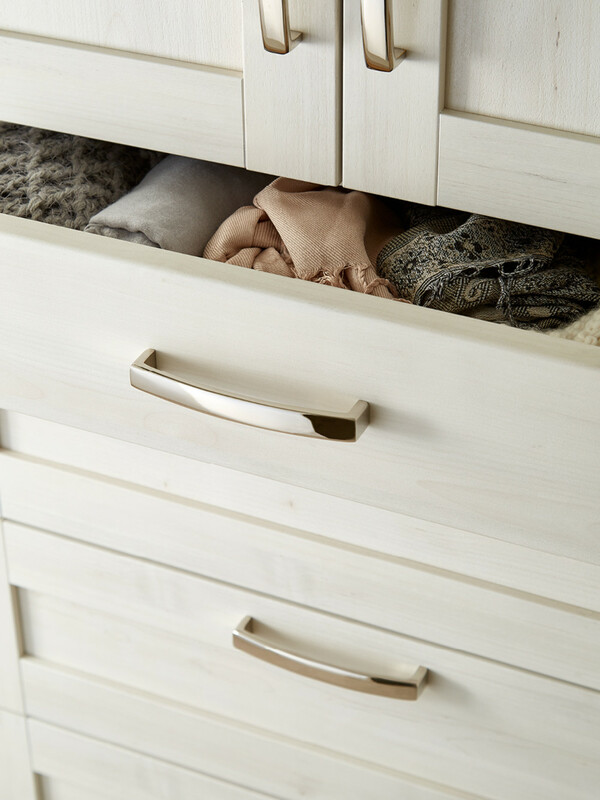 Scarves and other accessories are stored in convenient drawers. We recommend rolling scarves and t-shirts so you can see all your options at a glance. 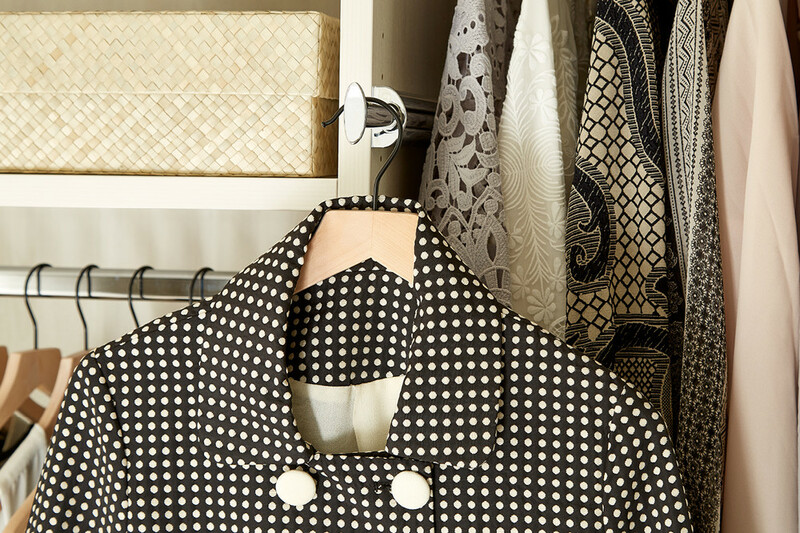 Extendable Valet Rods make it easy for the home owner to pull together complete outfits or simply hang up their dry-cleaning. Our Basic Lotus Wood Hangers make every article of clothing look like it's on display in a boutique.